Newsweek reports that the Internet protest of NSA surveillance launched yesterday saw more than 5,000 websites participate through placing memes and banners on their sites. 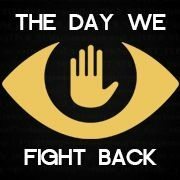 The effort was launched by Demand Progress as “The Day We Fight Back” and was backed by a broad coalition of activist groups and companies, including Access, Demand Progress, the Electronic Frontier Foundation, Fight for the Future, Free Press, BoingBoing, Reddit, Mozilla, ThoughtWorks, and many more. End the bulk collection of Americans’ records shared with third parties and put reasonable limits on Patriot Act powers targeted at people in the United States. The new restrictions would apply not only to phone records collected under Section 215 of the Patriot Act, but national security letters and pen registers that have also been abused. Amend the 2008 FISA Amendments Act to require that the government obtain a court order before using information about Americans collected during foreign intelligence operations. Increase transparency by allowing communications providers to disclose the number of surveillance orders they receive, mandate the government publish how many people are subject to surveillance orders, and make public significant FISA court opinions since July 2003. Create a public advocate that could advise the secret surveillance court in certain cases.